Abstract. 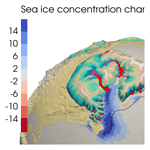 Heinrich events are among the dominant modes of glacial climate variability. During these events, massive iceberg armadas were released by the Laurentide Ice Sheet and sailed across the Atlantic where they melted and released freshwater, as well as detritus, that formed characteristic layers on the seafloor. Heinrich events are known for cold climates in the North Atlantic region and global climate changes. We study these events in a fully coupled complex ice sheet–climate model with synchronous coupling between ice sheets and oceans. The ice discharges occur as an internal variability of the model with a recurrence period of 5 kyr, an event duration of 1–1.5 kyr, and a peak discharge rate of about 50 mSv, roughly consistent with reconstructions. The climate response shows a two-stage behavior, with freshwater release effects dominating the surge phase and ice sheet elevation effects dominating the post-surge phase. As a direct response to the freshwater discharge during the surge phase, deepwater formation in the North Atlantic decreases and the North Atlantic deepwater cell weakens by 3.5 Sv. With the reduced oceanic heat transport, the surface temperatures across the North Atlantic decrease, and the associated reduction in evaporation causes a drying in Europe. The ice discharge lowers the surface elevation in the Hudson Bay area and thus leads to increased precipitation and accelerated ice sheet regrowth in the post-surge phase. Furthermore, the jet stream widens to the north, which contributes to a weakening of the subpolar gyre and a continued cooling over Europe even after the ice discharge. This two-stage behavior can explain previously contradicting model results and understandings of Heinrich events. 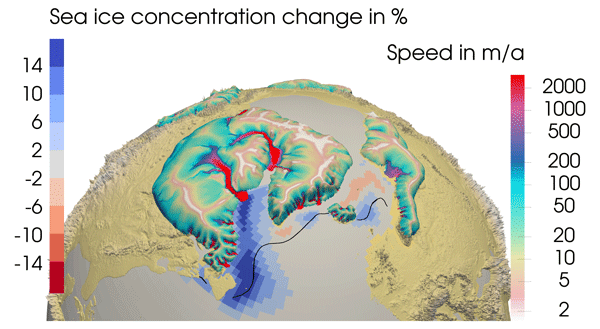 How to cite: Ziemen, F. A., Kapsch, M.-L., Klockmann, M., and Mikolajewicz, U.: Heinrich events show two-stage climate response in transient glacial simulations, Clim. Past, 15, 153-168, https://doi.org/10.5194/cp-15-153-2019, 2019.